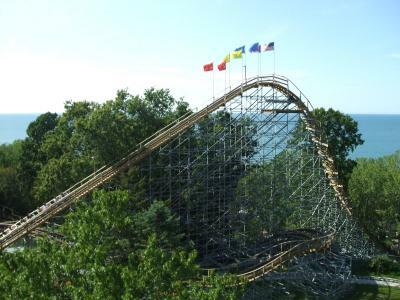 The Ravine Flyer II, a hybrid wooden roller coaster featuring a 120-foot drop, was ranked the best new ride of 2008 by Amusement Today magazine. There's just something about Waldameer Park. It can be difficult to put into words, but you sense it while walking the grounds — the blazing July sun on your skin, the aroma of the Potato Patch hanging in the air, the excited squeals of kids riding the Comet. There's a charm, a sense of nostalgia, an authenticity, a perception that the park is somehow yours. Cedar Point may pack more thrills, but Waldameer reminds one of simpler times — and for those of us who grew up here, it does feel like it's somehow ours. Waldameer Park has been a vital part of the city's fabric for well over a century. It rests upon an area once known as Hoffman's Grove, a 19th century local hotspot for picnics and beach-going. It was in 1896 when the Erie Electric Motor Company recognized the area's potential and they leased the land to create a trolley car park, renaming it Waldameer — German for "woods by the sea." As Erie entered the 20th century, working-class laborers found their 64-hour work weeks diminished thanks to a newfound national emphasis on progressive labor legislation. As a laborer's time spent at work decreased, their leisure time increased. Subsequently, amusement parks such as Waldameer experienced a boom throughout the United States. By the early 20th century, Waldameer had its first carousel installed. They soon erected a dance hall, a theater, a beer garden, aerial swings, and their first wooden rollercoasters. A walk down a ravine led patrons to a boardwalk that crossed the lagoon to the beach. John Miller wrote in his 1909 book on Erie County that Waldameer was a "fine park and pleasure resort" and he complimented the Erie Motor Company for having "more soul than any corporation has credit of possessing … [as they] cherished [Waldameer] with care and consideration." The original Ravine Flyer opened in 1922. As the well-known story goes though, it was torn down after a tragic death on the ride in 1938. That same year, a traveler's guide to Erie described the expanding Waldameer as having a "bathing beach, ballroom, concessions, amusement devices, restaurant offering music, dancing, floor show, and refreshments." It was also known for its natural beauty. "From the entrance of Waldameer Park, the highway winds down a cliff overlooking Lake Erie and Presque Isle Bay," the guide book detailed. "Tall, slender trees form a canopy over the highway. A constant lake breeze sweeps the entire peninsula, cooling the flat, sunswept beach." Despite many challenges, including the First World War, prohibition laws shutting down the beer hall, and the Great Depression, the park continued to evolve into a major summer destination in Northwestern Pennsylvania. It was in the summer of 1945 when a young boy from Dunkirk, New York, not yet a teenager, was hired to work at the park. His name was Paul Nelson. By 1965, Paul Nelson was running the park. By 1978, he owned it outright. Mr. Nelson oversaw the installation of the Whacky Shack, Pirate's Cove, Sky Ride, and other classic rides throughout the 1970s. In the '80s, he made the decision to construct an adjacent water park, naming it Water World. The '90s saw numerous other classic rides make their initial appearances, including the Sea Dragon, Ferris wheel, and Thunder River. 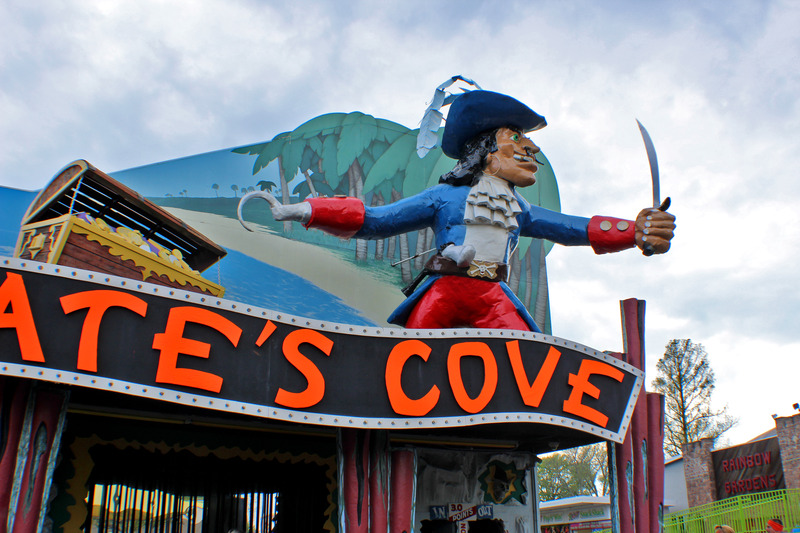 Captain Hook looms large over the Pirate's Cove, the labyrinthine walkthrough funhouse erected in 1972. Designer Bill Tracy passed away two years later. Seven decades later and Mr. Nelson, along with many of his family members (including daughter Nancy, company president and son-in-law Steve Gorman, and grandson and vice president of operations Brian Gorman) still walk the park day after day throughout the season. It truly is a family-run park — and its momentum for expansion has only increased in recent years. The construction of the award-winning Ravine Flyer II, the addition of numerous other new rides, and the unprecedented expansion of Water World (including the wave pool, a new Kid Zone, and an extraordinary Battle of Lake Erie themed water complex) has made the park not only a delightful getaway, but a legitimately thrilling and nationally competitive amusement park. Waldameer also remains one of the very few amusement parks throughout the United States choosing not to charge admission, parking fees, or for line-hopping passes. "I want the kid in poverty to come to Waldameer and I want the rich kid to come too," Mr. Nelson told the Erie-Times News in 2016. "I want everyone here." On a hot summer day, it can seem like everyone is at Waldameer. I have a feeling that is just how Mr. Nelson likes it.